Happy feet means a happy hike, and with the Superfeet Trailblazer Comfort Footbed slipped into your hiking boots, your feet will definitely be happy. 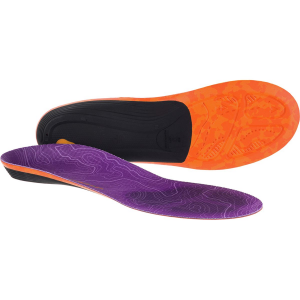 The Aerospring ascent dual comfort foam in the forefoot of the footbed provides reliable stability through the rigors of a good hike while the Evolyte carbon fiber stabilizer cap improves that support and stability for base comfort. Adding to that, a deep heel cup keeps your feet from slopping around in the boot while a Heel Impact Technology Pod disperses impact on your ascents and descents. The finishing touches come in the shape of Moisturewick technology with long-lasting odor control that keeps your feet fresh and dry mile after mile.